Home ARA Blog Where Can I Find Asbestos? The frightening answer to the question ‘where can I find asbestos?’ is - all around you. You can find asbestos in your workplace, your rental, and most disturbing of all, in your own home if it was built before 1990. All sorts of building materials containing asbestos were used in all parts of Australia until the 1990s. The number of structures that contain at least some asbestos is absolutely staggering. For example, 98% of the homes in Victoria built before 1976 are believed to contain asbestos (1). In New South Wales 52% of the houses built between World War II and 1954, or 70,000 homes, were constructed using asbestos cement (2). Around 20% of the homes built before the 1980s had asbestos roofs (3). Asbestos cement was one of the most common building materials used in Australia between World War II and the 1980s. Around 25% of the new homes built in the 1960s contained at least some asbestos cement. However, the most common use of the carcinogenic material was in walls (4). Asbestos wasn’t only used in new construction. Many older structures, such as Victorian-style houses, were remodelled with asbestos materials through the 20th Century. This means any building constructed before 1990 might contain asbestos. Today it is illegal to import, store, sell, install or supply asbestos. This means you may get into trouble by selling fixtures or materials from an old house. However, it is not illegal for you to have asbestos that was installed in your home before the ban. Unfortunately, there is no way to identify asbestos by sight; cement and other building materials that contain asbestos look no different from the regular varieties. The only way to tell if asbestos is present in your environment is to test for it. The test should be performed by a laboratory accredited by the National Association of Testing Authorities (NATA). To find an NATA lab in your area, you should call NATA or visit their website - www.nata.asn.au. It is highly recommended that you get the testing done before you start any maintenance, renovation or demolition work on any structure built before 1990. Even something as simple as tearing off old roof shingles can expose you, or your contractors, to asbestos. You should hire a professional asbestos contractor to do the dangerous work for you. They can remove any asbestos found on your property safely and professionally. A contractor should have a Class-A Asbestos Removal License. A licensed contractor will have workers with the training and safety gear needed to safely remove any contaminated material. The most common contaminated building materials consisted of cement mixed with asbestos fibres. Common names for these include: low density fibre boards, fibro, asbestos cement and AC sheeting. Be careful with any old building component stamped with the letters AC because it might contain up to 40% asbestos. Asbestos and cement are a dangerous combination because they turn into dust as they deteriorate, dust that people can breathe in. Bonded asbestos products, where the fibres were mixed with glue or plastic, are less dangerous but they can still fill the air with dangerous asbestos particles. Not surprisingly, the greatest danger of asbestos-exposure is during renovation or demolition, when people stir up clouds of dust by cutting or smashing walls or masonry. The good news is that new building materials do not contain asbestos. The material has been banned since 2003 and most manufacturers stopped using the substance long before then. This means the best way to protect your family, employees or tenants is to remove and replace all materials you suspect contain asbestos. This can get expensive because asbestos was used in almost every building component or material imaginable before 1980. The biggest threat in commercial properties is loose-bound asbestos, which was widely used as insulation before the 1980s. It was packed into walls and roofs, and it was often used for soundproofing. Loose-bound asbestos can also be found in old heaters, stoves and heating systems. Hot water pipes were often covered with loose asbestos. It was also used to back tiles and linoleum floor coverings. Loose-bound asbestos is the most dangerous of all because it is 100% asbestos and can turn to toxic dust with just a touch. The loose-bound material is so dangerous that only an asbestos removalist with a Class-A License should work with it. If you suspect loose asbestos is present in your environment, get away and call a specialist as soon as possible. 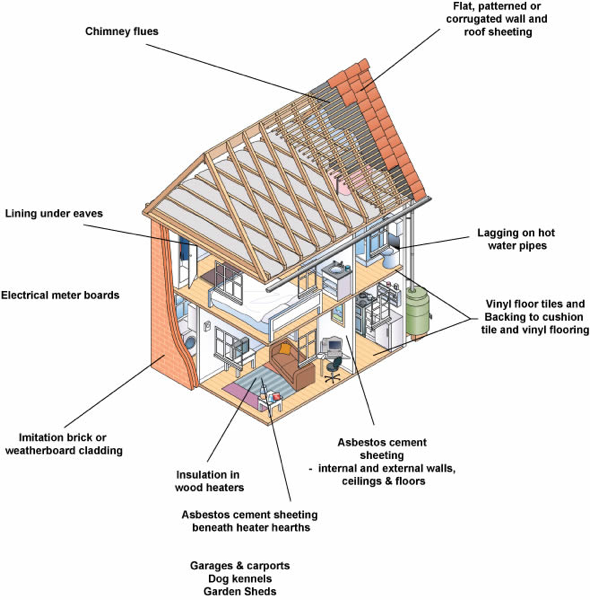 Where You Can Find Asbestos in Your Home? Wall and roof sheeting of all types; flat corrugated and patterned. The lining under the eaves. The boards inside electrical meters. Imitation brick, stone or weatherboard cladding (especially in 1940s and 1950s homes).Vinyl floor tiles. Drywall sometimes contained asbestos cement sheeting. Outside walls, including ones that look like stucco. The lagging or coating on hot water pipes and radiators. The insulation in old wood and coal-burning heaters and fireplaces. The sheeting beneath furnaces, fireplaces, boilers, heaters and stoves. Hot water pipes and radiators that are built into masonry walls. Be vigilant because asbestos can be found in any room of your home. In older houses it might also be present under more recently-installed floor and wall coverings. You should also be careful around any old building materials dumped or stored on your property as they might also contain asbestos. Unfortunately, little information about the names of asbestos-bearing products manufactured before 1980 is available. This means the only way to safely avoid asbestos exposure during a remodelling project in an older home or building is to test for it, or safer still - call an asbestos removalist.